The Sonic Electro Acoustic System comprises the bridge pickup, internal pre amp and power supply. At the heart of the system is a hand built twin transducer bridge. The standard bridge is manufactured in two parts enabling the top half to be replaced should you wish to change the set up, or if it becomes damaged. The lower section contains two small, very low mass ceramic transducers set above each bridge foot on which the upper bridge piece sits. This configuration, and traditional bridge design, captures the natural dynamics and balance of the instrument both from the strings and the body. The transducers are internally connected to a carefully designed, ultra high impedance, discrete class A pre-amp. The pre-amp is powered by a standard 9V PP3 battery mounted in an easily accessible spring loaded drawer below the chinrest. This mounting position eliminates the feel of the additional mass. Many Electric Violins use lower voltage batteries or capacitors, these seriously compromises the preamp headroom and therefore the dynamic range of the instrument. A standard ¼” jack socket is mounted in the internally reinforced rib of the left hand lower bout. 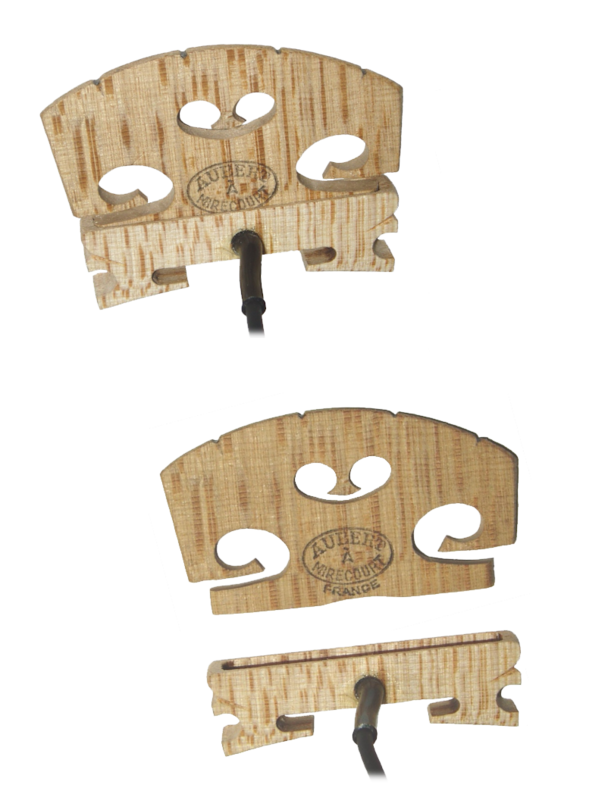 A "Deluxe" transducer bridge is also available for violin and viola; this was developed for the Sonic Heritage range where the acoustic performance is very much a part of the appeal of the instrument. The transducer is permanently assembled as one piece to reduce the foot width to that of a standard acoustic bridge. This transducer is available as an option on all other models for an additional £60. The standard Cello and Bass bridges are both one piece designs. ”Having already tried, tested and bought the Sonic Viola and being very happy with it, I have now had the same system installed on one of my 'Saxon' violins. It's an excellent replacement for my main fiddle which can now have its million mile service. The Sonic is the first viable replacement I've found in 35 years!!! I recommend them.